You can complete these requirements by attending the numerous live physical therapy seminars offered throughout the state. Or, you can attend the annual CPTA conference in September (if that coincides with your personal CE deadline). 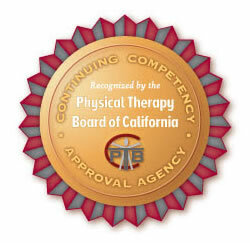 Any of these options are good outlets for obtaining those pesky physical therapy CEUs. But if you’re like many PTs (and PTAs) that juggle a busy practice schedule and family responsibilities, you might find it difficult to take time off for traveling to attend live courses. And let’s not forget budgeting to afford the price of conference registration, hotels and travel fare. If you’re looking for a different option to fulfill your PT or PTA CEUs, consider online resources.